Writing a book was initially a distraction from the chronic pain I was in, a hobby once I suddenly found myself with severely restricted mobility. 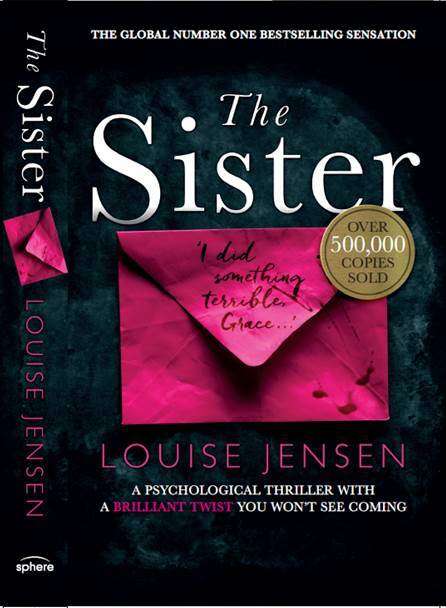 Even now, I still remember the utter disbelief and excitement when I realised I had an actual finished novel and it was only then I started to think about putting together a submission package and sending my debut, Buried Memories (later retitled The Sister by my publishers) out into the world. I devoured books, blogs, Googled endlessly for tips on how to write the perfect submission letter, and word by painful word, crafted my offering, almost editing it more than my manuscript. My palms were clammy as I sent off my first submissions, only to two agents at that time, and sat back to wait the alleged 6-8 weeks I’d read about. To my surprise both agents replied within a few hours, they’d loved my letter, been hooked by my elevator pitch, thought the premise was brilliant and and would start reading straight way. Do keep them informed of any offers. What happened to an 8-week wait? Cue total panic (never sub before your manuscript is ready – but that’s another story). I’m no expert, and neither do I claim to be, but I’ve a few friends at the moment who have reached submission stage and so for them, and everyone else putting together a package, I wanted to share my letter. I do hope it’s helpful. Next week, for Part II, I’ll be joined by fabulous literary agent, Rory Scarfe, of Furniss Lawton with his guidelines to giving your submission letter a head start. Good luck to all those subbing! I enclose the first three chapters and synopsis of my domestic noir novel, ‘BURIED MEMORIES’ a book about a grieving girl who thought there was nothing as frightening as being alone – she was wrong. The novel is complete at 80,000 words. ‘I’ve done something terrible, Grace. I hope you can forgive me.’ Grace Matthews, an anxious young woman is devastated when her best friend, Charlie, dies and feels that until she discovers the meaning behind Charlie’s last words, she cannot move forward. As Grace becomes sucked into the mystery surrounding Charlie’s family, her association with them, especially with Charlie’s sister Anna, threatens to destroy Grace’s career, relationship and ultimately, end her life. Grace’s hunt for the truth forces her to confront the childhood she desperately wanted to forget and she realises she can’t trust anyone, especially those she loves. Posted on September 29, 2017 by Fabricating Fiction/Louise Jensen	• This entry was posted in Novel writing and tagged agents, author, creative writing, editing, louise jensen, novel writing, psychological thrillers, publishing, submission letter, submissions, submitting, writing. Bookmark the permalink. I love this! Perfect length, tells them exactly what they need/want to know without rambling and the plot summary is captivating! I’m usually super good at rambling! Fantastic letter – it really makes me want to read the book. Although I’m sure your opening chapters would have convinced the agents anyway! Thanks Katy. I think all agents must approach the process differently, but certainly of the ones I’ve spoken to over the last couple of years the majority seem to say they read the letter before the opening chapters. I think you have to get it all right. Perfectly worded Louise. Being in a position where I’m starting to think about submissions, I’ve obviously been over thinking it! Thank you for sharing one of your secrets to success! You’re welcome. There are more parts to come in this series. Good luck! Thank you for this very generous gift! That’s, great! That’s for sharing, Louise. Just want to say thank you for your generosity! Looking forward to trying something similar out – although your first three chapters must have been wonderful too. Thank you! Good luck with yours. Thanks for sharing this, Louise. I’m quite familiar with cover letters for submitting to literary journals, but eventually, I’ll have to write submission letters for my book and they are completely different. This will be a great reference when I get to that point. Thanks Mandie. Glad it was useful. Best of luck! Thank you so much for sharing your letter. That is worth its weight in gold! Do you have books you recommend for writers new to the publishing industry? I am an academic who has published a book and articles in academic presses, and have been out of the literary publishing industry since 2001. Thank you for sharing your wealth of knowledge! Hello. Do you mean books specific to getting published? If so you can’t go wrong with The Writers’ & Artists yearbook. I should think the 2018 edition is available about now. Ooh good luck with yours Charles! Thanks. BTW – just back from London Book Fair where I saw Rory on a panel about getting an agent. Excellent stuff. You have a good agent there.